Bright and imaginative 9-year-old June spends her time with her mother creating an imaginary theme park called Wonder Park Wonderland, populated by incredible rides and talking animals. 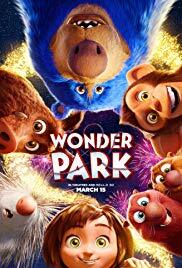 After a tragedy strikes, June runs into a nearby forest and finds herself magically transported to Wonder Park Wonderland, where she meets all of her previously imaginary characters and helps them in a war against an evil force that has invaded the park. The animation in Wonderland Wonder Park is quite good – bright and colourful – but I was kinda struck by the darker, philosophical subtext of the story. Me and my dumb grown-up brain are clearly triggered by the image of a talking porcupine coming to terms with its own existence. There’s a lot of zippy action sequences, but if there was an ending where they revealed she had been in a coma the whole time, I would not have been surprised. But my friend’s six year old loved it, so if you’re my friend and you have a six year old, good chance they’ll like it? And apparently Fitzy and Wippa are our Kenan Thompson and Ken Jeong.